Sánchez Azcona 317 Int 202, Col Del Valle, México D. F.
Background: Trichomycosis is asymptomatic bacterial infection of the axillary hairs caused by Corynebacterium sp. Objective: to bring a series of cases of trichomycosis, its clinical and microbiological experience. Materials and Methods: This report consists in a linear and observational retrospective study of 15 years of cases of trichomycosis confirmed clinically and microbiologically. Results: Fifty six confirmed cases of trichomycosis were included in this report. The majority were men 53/56 (94.6%), mean age was 32.5 years. The most commonly affected area was the axilla (92%), trichomycosis flava was the principal variant 55/56 (98.2%) and signs and symptoms associated were hyperhidrosis (87.5%), hairs' texture change (57.1%) and odor (35.7%). Bacterial concretions were observed in all cases, and the predominant causative agent in 89.3% of all cases was Corynebacterium sp. Thirty patients were included in therapeutic portion of the study, and 28 (93.3%) of them experienced a clinical and microbiological cure. Conclusion: Trichomycosis is asymptomatic, superficial infection, which primarily affects axillary hairs. Our principal objective is to present a series of cases, their clinical and microbiological aspects and emphasize that this clinical entity in axillar and genital hairs maybe is underestimated. This is a retrospective study of 15 years (from 1997 to 2011). All patients included had diagnosis of clinical trichomycosis and were confirmed microbiologically. A clinical history, an examination under Wood's light and microbiological tests was performed on each patient. In all cases, there took hair of the affected region, by means of court with scissors and the sample was divided in two parts for its study, for examination and culture. The samples were examined microscopically with KOH 20% and cotton blue preparations, and cultured in brain-heart infusion agar, and chocolate-blood agar. Positive cultures were Gram-stained to identify coryneform-bacteria forms, and isolated cultures were subsequently identified by biochemical testing using the MicroScan-system ® . The main demographic characteristics and microbiological findings of the study are shown in [Table 1]. 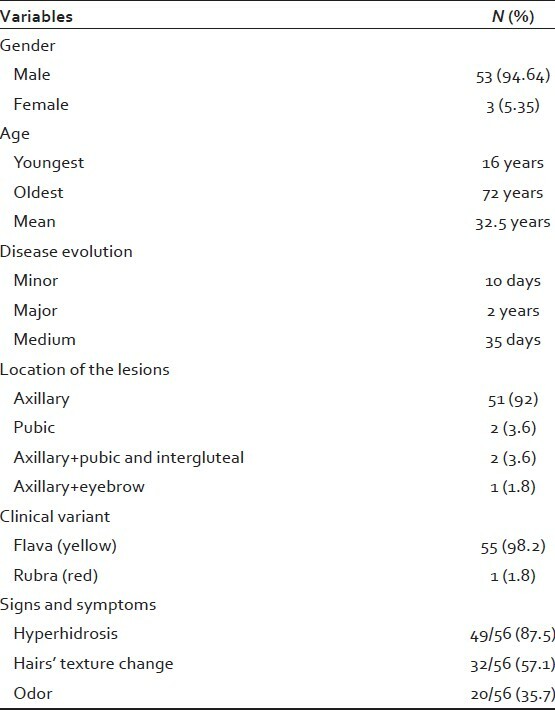 It is important to point out that 32 out of the 56 patients (57.1%) sought medical attention because they felt a change in the texture of the affected hair, and the rest of the patients were diagnosed during careful, deliberate search by visual inspection and examination under Wood's light [Figure 1], [Figure 2] and [Figure 3]. Eighteen of the fifty-six patients (32.2%) related their condition to athletic activities and to the use of clothing made of lycra. Of the 56 cultures that were obtained, only 18 were identified by the MicroScan WalkAway ® 9651 system, which identified Corynebacterium Centers for Disease Control (CDC) group G/LD; according to Bergey's Manual,  this is indicative of Corynebacterium flavescens [Figure 4]a & b and [Figure 5]. There were two patients who, in addition to axillary trichomycosis, also presented with two related conditions affecting the inguinal zone (erythrasma) and the soles of the feet (pitted keratolysis) [Table 2]. Trichomycosis, a more correct term would be trichobacteriosis or bacterial trichonodosis is a superficial infection, primarily of the axillary hair, which can exhibit three different clinical presentations: The most common clinical variant is trichomycosis flava (yellow), while rubra (red) and nigra (black) variants occur much less frequently. ,, From the earliest reported cases of trichomycosis, the causative agent was classified as C. tenuis. In light of the new taxonomic position of the genus Corynebacterium, however, that particular species is no longer considered, and thus, the majority of the reports are left as Corynebacterium sp. However, some studies  have shown that the causative agent belongs to the so-called group 2 (LD2) (also referred to as the CDC-G/LD group), that it corresponds to the C. flavescens species, and that it is related to the flava variant. , In the present study, we were able to identify this particular species in 18 of the cases. No specific causative agent could be identified in the remaining 38 cases, which were simply classified as Corynebacterium sp., according to their microscopic characteristics because presented Gram-positive rod-shaped forms. It should also be mentioned that only 32/56 of patients (57.1%) sought medical attention as a result of having felt a change in the texture of the hair, odor and in most cases accompanied by increased sweating (hyperhidrosis), while the rest of the patients were diagnosed during a careful, deliberate search. , Practically, all of the patients (98%) presented with the flava variant, and only one patient, who sought medical attention after developing "reddish sweat," presented with the rubra variant, and was and was proven by the isolation of cultures, which was due to a mixture of microorganisms: Corynebacterium sp. (white-yellow growth) and Serratia mascescens (red growth), and probably the red form due to the latter bacteria produce carotenoid pigments. There is a series of case reports in the literature involving patients with mixed infections caused by different corynebacteria, the so-called corynebacterial triad consisting of trichomycosis, erythrasma and pitted keratolysis; in our study, there were two patients who also presented with erythrasma and pitted keratolysis, ,, another example is the report of Rho and Kim,  whom found a high incidence of trichomycosis in Korean soldiers, co-existing with erythrasma (20.4% of cases) and with pitted keratolysis (13% of cases). 1. O'Dell ML. Skin and wound infections: An overview. Am Fam Physician 1998;57:2424-32. 2. Crissey JT, Rebell GC, Laskas JJ. Studies on the causative organism of trichomycosis axillaris. J Invest Dermatol 1952;19:187-97. 3. Freeman RG, McBride ME, Knox JM. 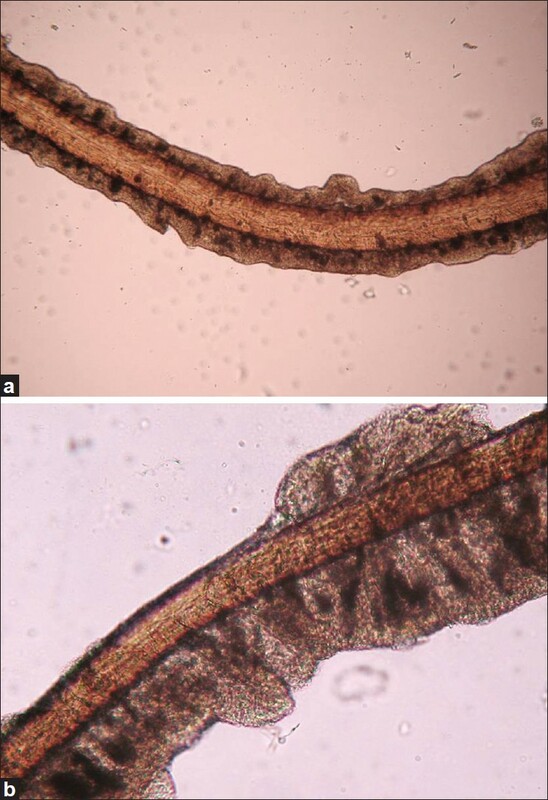 Pathogenesis of trichomycosis axillaris. Arch Dermatol 1969;100:90-5. 4. Bargman H. Trichomycosis of the scrotal hair. Arch Dermatol 1984;120:299. 5. McBride ME, Freeman RG, Knox JM. The bacteriology of trichomycosis axillaris. Br J Dermatol 1968;80:509-13. 6. McBride ME, Duncan WC. Trichomycosis axillaris. Arch Dermatol 1972;105:459-60. 7. Holt JG, Krieg NR, Sneath PH, Stanley JT, Williams ST. Bergey`s manual of determinative bacteriology. 9 th ed. Baltimore: Williams and Wilkins; 1994. 8. Zawar V. Photoletter to the editor: Trichomycosis (trichobacteriosis) axillaris. J Dermatol Case Rep 2011;5:36-7. 9. 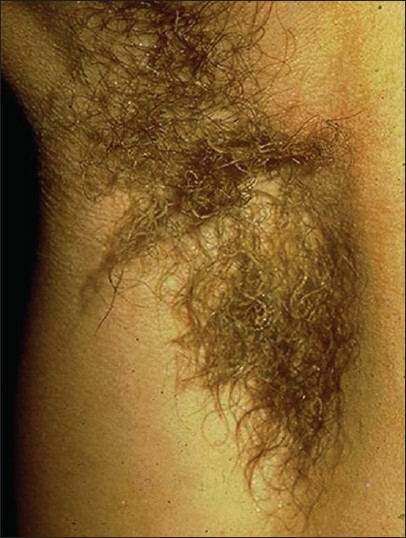 García-Martos P, Ruiz-Henestrosa JR, Pérez-Requena J, Marín P, Mira J, Calap J. Hyperhidrosis and multiple nodules in the hairs of the axilla. Enferm Infecc Microbiol Clin 2001;19:177-8. 10. Clarridge JE, Spiegel CA. Corynebacterium and miscellaneous irregular gram-positive rods, erysipelothrix, and gardnerella. In: Murray PR, Baron EJ, Pfaller MA, Tenover FC, Yolken RH, editors. Manual of Clinical Microbiology. 6 th ed. Washington: American Society for Microbiology; 1995. p. 357-78. 11. Levit F. Trichomycosis axillaris: A different view. J Am Acad Dermatol 1988;18:778-9. 12. Peñaloza MJ, López NA. Corinebacteriosis cutánea. Rev Cent Dermatol Pascua 2001;10:141-6. 13. Wilson C, Dawber R. Trichomycosis axillaris: A different view. J Am Acad Dermatol 1989;21:325-6. 14. Orfanos CE, Schloesser E, Mahrle G. Hair destroying growth of Corynebacterium tenuis in the so-called trichomycosis axillaris. New findings from scanning electron microscopy. Arch Dermatol 1971;103:632-9. 15. Shelley WB, Miller MA. Electron microscopy, histochemistry, and microbiology of bacterial adhesion in trichomycosis axillaris. J Am Acad Dermatol 1984;10:1005-14. 16. Lestringant GG, Qayed KI, Fletcher S. Is the incidence of trichomycosis of genital hair underestimated? J Am Acad Dermatol 1991;24:297-8. 17. Avram A, Buot G, Binet O, Gracia AM, Cesarini JP. Clinical and mycological study of 11 cases of genitopubic trichosporosis nodosa (white piedra). Ann Dermatol Venereol 1987;114:819-27. 18. De Almeida H Jr, Götze F, Heckler G, Marques e Silva R. Trichomycosis capitis: First report of this localization and ultrastructural aspects. Eur J Dermatol 2011;21:823-4. 19. Shelley WB, Shelley ED. Coexistent erythrasma, trichomycosis axillaris, and pitted keratolysis: An overlooked corynebacterial triad? J Am Acad Dermatol 1982;7:752-7. 20. Samalens-Isack G. Trichomycosis-erythrasma. Soins 1985;448:17-8. 21. Finch J. Case of trichomycosis axillaris and erythrasma. J Drugs Dermatol 2011;10:1472-3. 22. Rho NK, Kim BJ. A corynebacterial triad: Prevalence of erythrasma and trichomycosis axillaris in soldiers with pitted keratolysis. J Am Acad Dermatol 2008;58:S57-8. 23. Bonifaz A, Gómez-Daza F, Paredes V, Ponce RM. Tinea versicolor, tinea nigra, white piedra, and black piedra. Clin Dermatol 2010;28:140-5. 24. Szabo S, Lieberman JP, Lue YA. Unusual pathogens in narcotic-associated endocarditis. Rev Infect Dis 1990;12:412-5. 25. 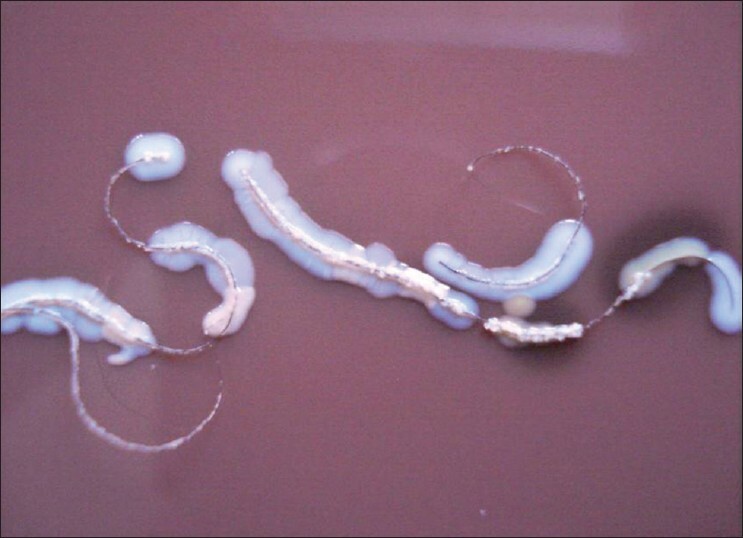 Yokota M, Okazawa A, Tanaka T. Serratia marcescens as an opportunistic human pathogen. Nihon Saikingaku Zasshi 2001;56:527-35. 26. Bachmeyer C, Sanguina M, Turc Y, Reynaert G, Blum L. Necrotizing fasciitis due to Serratia marcescens. Clin Exp Dermatol 2004;29:673-4. 27. Rosen T, Krawczynska AM, McBride ME, Ellner K. Naftifine treatment of trichomycosis pubis. Int J Dermatol 1991;30:667-9.